Gamma Solutions introduces the Honeywell CV41 vehicle mount computer recommended for forklift applications. Providing the ideal balance of operator usability, application performance, and ease of deployment and maintenance, Honeywell CV41 vehicle mount computers are perfectly sized for use with forklifts, simplifying installation, reducing visual obstruction and ensuring ease of operation with a glove compatible keyboard and a 20cm display. 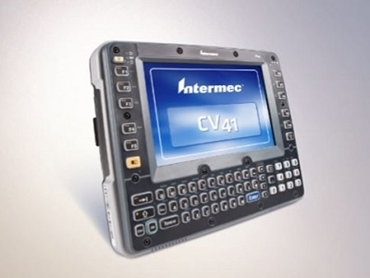 The Honeywell CV41 offers the accuracy, productivity and safety of hands-free voice directed work, and is the only Windows CE vehicle mount computer on the market with Vocollect VoiceCatalyst. A fully integrated CAN-BUS interface allows leading fleet management applications to be run and helps the fleet operator gain better visibility into their forklift investment to maximise utilisation. Key features also include on/off ignition sensing allowing workers to minimise starting up times; UPS back-up battery with up to 30 minutes of operating time, reducing reconnect and reboot time; unique quick-mount dock design allowing for easy, one-hand docking and undocking of the device; and comprehensive network options including 802.11 a/b/g with Cisco CCXv4 certification and integrated Bluetooth to offer best-in-class wireless range, roaming reliability and security, even in areas experiencing low signal levels or intermittent connections. Honeywell CV41 vehicle mount computers also feature tight integration with scanners/imagers, printers, RFID, device management and client software, enabling easy deployment into the operation. The CV41 operates across a wide temperature range from -30°C to +50°C, and also supports an optional touchscreen defroster for cold storage and freezer environments. Built to maximise ruggedness and minimise downtime, the CV41 includes user-replaceable touchscreen and keyboard assemblies. Paul Pleming, National Sales Manager at Gamma Solutions adds that the CV41’s versatility, ruggedness and ability to keep workers going through switching machines and low connectivity make it one of the best forklift devices on the market.